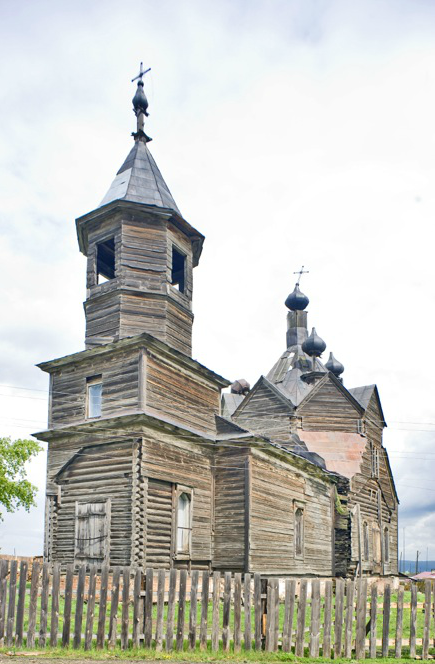 Located on the bank of the Yenisei outside the Siberian city of Krasnoyarsk, the village of Barabanovo draws pilgrims due to its church dedicated to an unusual saint. In the vast territory along the Yenisei River, notable for its severe climate and deep forests, there are settlements that seem to exist in another time. One such place is the small village of Barabanovo, located near the left bank of the Yenisei River some 40 miles to the northwest of the Siberian metropolis of Krasnoyarsk. Although situated near one of Siberia’s most advanced industrial regions, Barabanovo seems in a number of ways to be a relic of the 19th century. To this day, its dominant landmark is a mid-19th century wooden church dedicated to a 3rd-century martyr, Saint Paraskeva. In a pattern typical of Siberia’s early development, Barabanovo was founded in the mid-17th century as a community of Cossacks, who combined farming skills with the hardiness and bravery needed for life on the Siberian frontier. The name is related to the Russian word for “drum,” but local lore attributes it to the name of one of the original settlers, Vasily Barabanov. By virtue of its fertile, well-drained soil on elevated land near the river, the village took root, and by the beginning of the 20th century, the Barabanovo parish, which included three nearby hamlets, had a population of over 2,000. Among them were exiles and peasant settlers from the west of Russia, part of an early 20th-century state policy encouraging land-poor peasants to populate the vast territory of Siberia. During the past century, Barabanovo experienced the fate of so many Russian villages, as labor-intensive agricultural practices faded in a new industrial era. As a result of these demographic shifts, Barabanovo itself now has only 125 residents, but the village club still functions. Good paved roads nearby allow ready access to Krasnoyarsk and its suburbs. One of the major events in the history of the village was the creation of a parish in 1854. 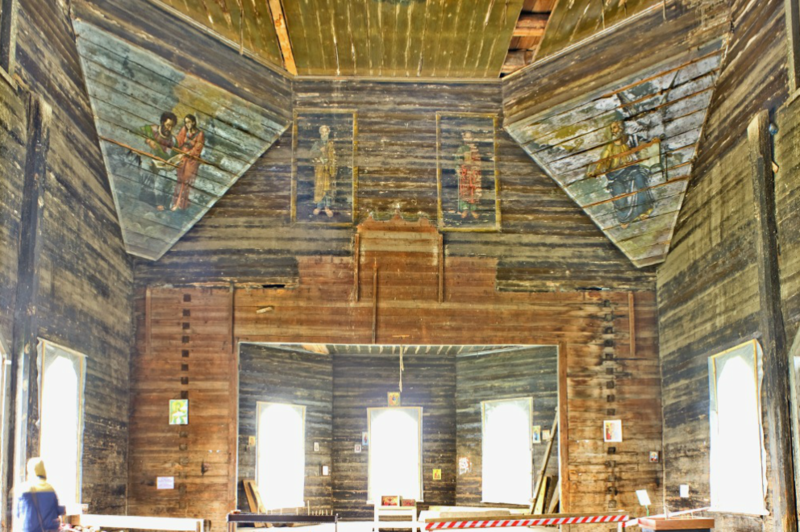 This in turn led to support of the building a large wooden church dedicated to St. Paraskeva-Pyatnitsa, located on a rise overlooking the village and the Yenisei River in the distance. Indeed, the church has maintained a presence that extends far beyond the modest village of Barabanovo. This renown can be attributed in large part to its dedication to Paraskeva-Pyatnitsa, one of the Russian Orthodox saints most revered by peasants and ordinary people. According to church accounts, Paraskeva was born in the 3rd century to Christian parents in Iconium (present-day Konya in Turkey). Her name, derived from the Greek word for Friday, is said to refer both to the day of her baptism and to the day of Christ’s Passion, or Crucifixion. As a young woman, she actively propagated the Christian faith and was martyred during Diocletian’s relentless persecution of Christians. The Paraskeva-Pyatnitsa cult became widespread in the Russian North—originally under the control of Novgorod—and subsequently in Siberia. She became known as a protector of marriage, as well as a healer who protected both people and livestock. The array of her practical duties was comparable to that of St. Nicholas. The design of the Paraskeva Church shows the evolution of 19th-century wooden architecture under the influence of masonry architecture. The square main structure culminates in an unusually complex roof with eight gables and five decorative cupolas. In a typical pattern, a vestibule leads to a bell tower over what was once the main entrance at the west end. The interior has been cleaned, but shows the effects of decades of neglect. 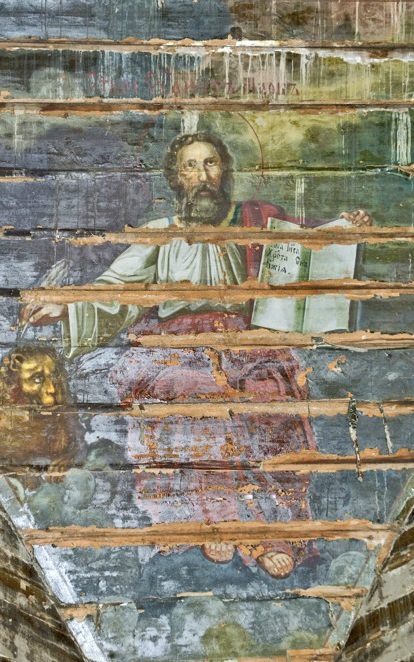 Nonetheless, a few wall paintings remain, including paintings of the four Evangelists — Matthew, Mark, Luke and John. Traditionally the Evangelists are on spandrels above the four piers supporting the central dome in a Russian church. This church was constructed without such piers, yet the builders found an ingenious solution: to paint the images on triangular panels at the upper corners of the structure. Each evangelist is accompanied by his symbol: Matthew with the angel, Mark with the lion, Luke with the bull and John with the eagle. Painted in a primitive, bold academic style, the faces of the Evangelists display a vigorous expressive power. At the top of the ceiling is an image of Lord God Sabaoth. As for Paraskeva, her image would have been prominently displayed as an icon, but the church icon screen has not survived. The Paraskeva Church was sturdily built to withstand the ravages of time and the fierce winter winds that buffet its exposed site. Films have been made at its location. Pilgrims visit the church with the help of the priest at the restored Church of the Trinity in the neighboring village of Chastoostrovskoe. Despite this attention and some conservation efforts to maintain the structure, the church at Barabanovo is in obvious need of repair. Finding the resources for such a major undertaking in a small village is a difficult challenge, but hope remains for its preservation. 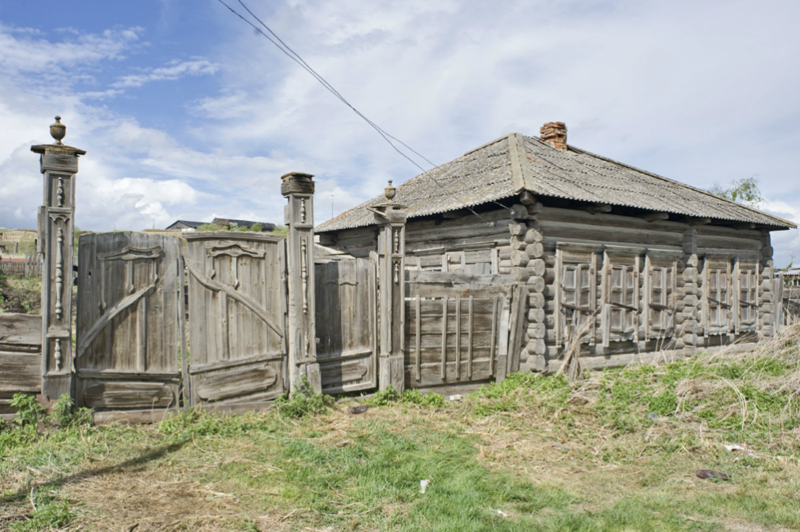 The village of Barabanovo also has a number of traditional wooden houses that have been well preserved by their owners. Their dark log walls provide a background for painted shutters and decorative window surrounds (nalichniki) that are such an appealing part of traditional Russian culture.